News FocalPoint Server NAB Preview! We are holding two Webinars on Tuesday 26th March 2019. Please see invite below for details. FocalPoint Server the only solution that enables real-time collaboration of FCP-X libraries between users. Join our Webinar to preview our latest Ingest Tool, integrated with DaVinci Resolve Studio. Please email Alyson Colman and ‘Go to meeting’ details will be sent to you. 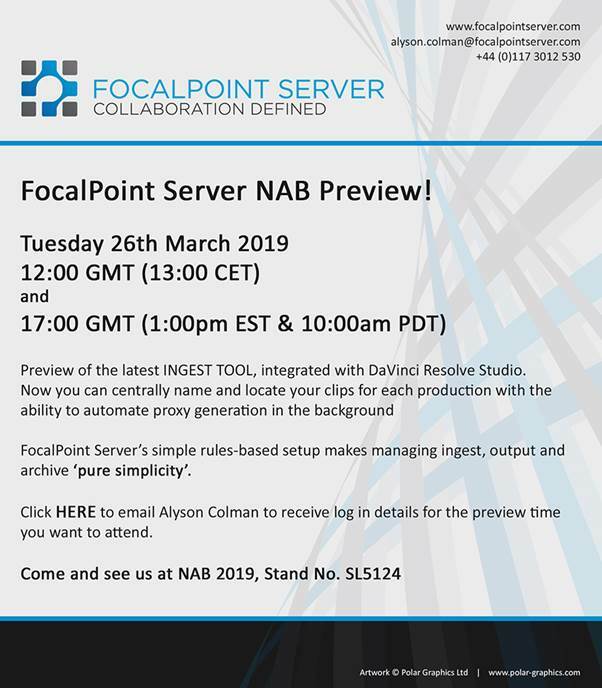 If you are unable to attend our Webinar but are interested in FocalPoint Server please come and visit us on Stand SL5124 at the NABSHOW Las Vegas Convention Center anytime between the 8th and 11th April 2019.